The Lenticular printing process utilizes a combination of specially prepared graphics and lenticular lens to create printed images that have the illusion of depth or motion. Lenticular lens is made up of repeating rows of convex lenses (lenticules) on the front surface of the material, and a flat surface on the back side of the material that can either be printed on directly, or have a pre-printed graphic mounted to it. The process of preparing graphics for use with a lenticular lens is commonly called “interlacing”. An interlaced image is made up of repeating slices of multiple images that are either multiple views of one scene for 3D, or multiple frames of an animated or multi-image sequence. 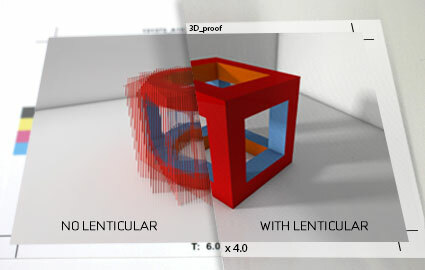 The interlaced image is then printed in register to the lenticular lens, and can have a variety of visual effects when viewed from different angles. You don’t have to be limited when it comes to lenticular printing. We have the perfect lenticular style to match your marketing efforts. 3D lenticular is the illusion of depth on a normally flat surface. 3D lenticular printing is accomplished by layering art or photos under a lens. 3D lenticular can be the most visually appealing effect. 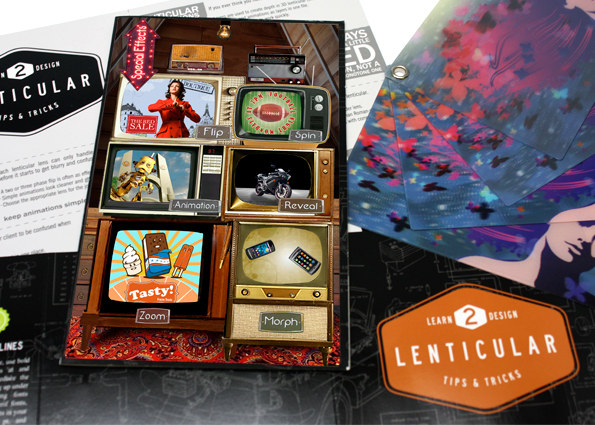 View our video on how to set up your files for 3D lenticular print. An image flip is also know as a 2-Phase or 3-Phase. Though it is the simplest of all animation effects, it is often the most effective. Lenticular flip technology allows up to three separate images to be combined and seen independently when viewed at different angles. View our video on how to best set up your files for a flip. Lenticular morph technology gradually changes one element into another element. Although any two elements can be morphed, morphing works best when two images are similar in shape and on a common background. Adding zoom technology can effectively emphasize both image and text to gain maximum visibility. Animations include size changes and spins. Full motion video or multi-phase uses multiple frames of an action or illustration showing movement from beginning to end. Full motion is much like watching a movie clip in the palm of your hand. This effect is best optimized when the background remains constant throughout the sequence. View our video on how to set up your files for video and animation. Combinations allow you to use two animations in one. This is most commonly used to combine 3D with flips, but can also be used to add flips to Morphs, Zooms and Full Motion Video. Most 3D technologies rely on stereoscopy. Stereoscopy is the process of providing slightly offset views of an image to the left and right eyes of the viewer to create an illusion of depth and volume. In lenticular technology, an interlaced graphic is prepared that has multiple slightly offset views of the same image. When viewed behind a lenticular lens, each eye sees a different view of the image, and the image appears to have objects or scenery that recede back into the image, or appear to float off the surface of the image. Read more about the importance of depth and focal points and design considerations for lenticular 3D on our lenticular expert blog.